Special Operation 25 ( Spec Ops 25 ) Runaways is now live. 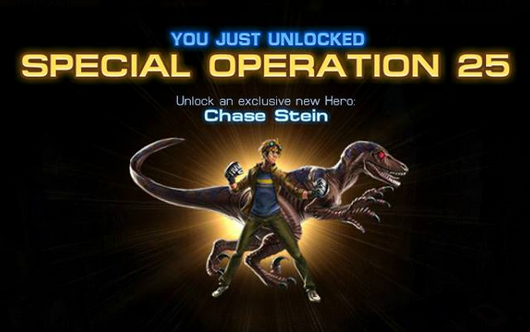 A total of 25 Tasks need to be completed in order to unlock and recruit Chase Stein. Tasks like fights have to be completed separately. "Under the careful watch and guidance of Agent Coulson, Maria Hill, and Hawkeye, the Runaways embark on an undercover operation in the criminal underworld, searchin for answers to the coded message left behind by the mission Director Fury." More update is coming soon. Hi, Agents. Here is season 2 chapter 5 task list. You can read Season 2 chapter 5 patch note and Season 2 Chpater 5 Mission Info. These set of Tasks are unlocked after completing the tasks in Chapter 4 - Globetrotting . Hercules is not an Epic Boss Deploy Hero requirement but is required to unlock the Premium Mission that has the Epic Boss. Sentinels can be found in Season 2 Chapter 5 Mission 1. White Gorilla Grunts can be found in Season 2 Chapter 5 Mission: 2 and 6. Taskmaster is the Boss of Mission 2: Grudge Match. Circle of Eight minions can be found in Season 2 Chapter 5 Mission 3. The Hood is the Boss of Mission 3: Up a Tree. Hellfire Club Soldiers can be found in Mission 4: Cleaning House. Green Goblin is the Boss of Mission 4: Cleaning House. Dark Elves can be found in Mission 5: Rehabilitation. The Ragnarak is the Boss of Mission 5: Enchanted. Defeat six HYDRA soldiers. HYDRA soldiers can be found in Season 2 Chapter 5 Mission 6. Ares is the Team-Up in Mission 2: Grudge Match. Modern Warfare is Ares' second ability. Ares is the Team-Up in Mission 2: Grudge Match. Squirrel Girl is the Team-Up in Mission 3: Up a Tree. Furry Fury is Squirrel Girl's second ability. Squirrel Girl is the Team-Up in Mission 3: Up a Tree. Emma Frost is the Team-Up in Mission 4: Cleaning House. 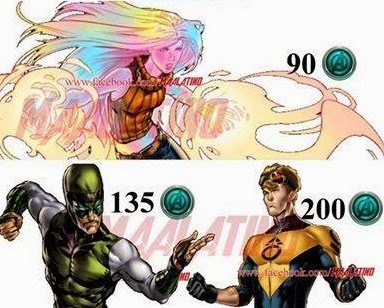 Unlock Potential is Emma Frost's third ability. She is the Team-Up in Mission 4: Cleaning House. Thor is the Team-Up in Mission 5: Enchanted. Inspire Bravery is Thor's third ability. Thor is the Team-Up in Mission 5: Enchanted. 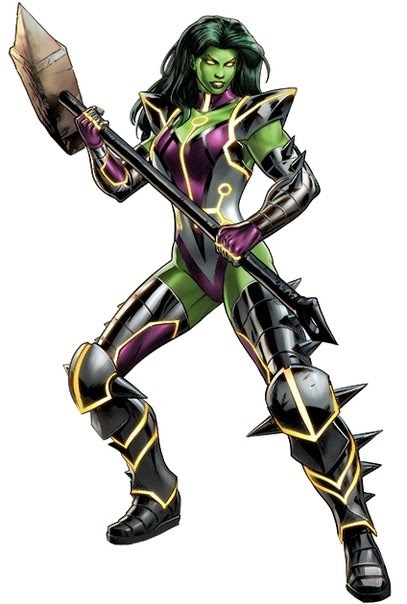 Enchantress is the Epic boss in Mission 5: Enchanted. Hercules is the Team-Up in Mission 6: Deific Inadequacy. Column Down is Hercules' fourth ability. Hercules is the Team-Up in Mission 6: Deific Inadequacy. Man-Ape is the Epic Boss in Mission 6: Deific Inadequacy. 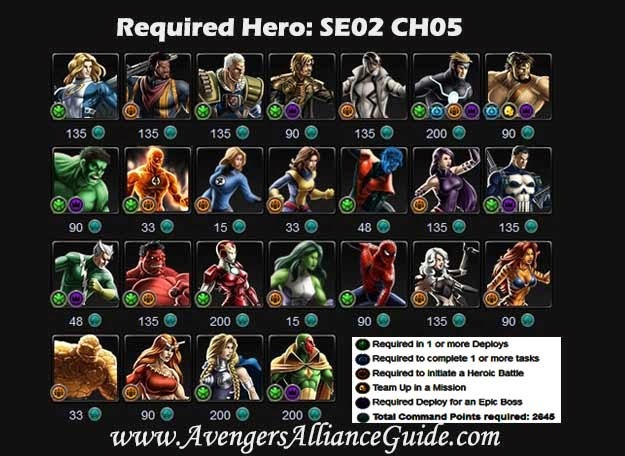 SE02 Chapter 4 Tasks are unlocked after completing 20 tasks in Chapter 3. 3 Tasks Completed: Mission-2 Unlocked! 7 Tasks Completed: Mission-3 Unlocked! 11 Tasks Completed: Mission -4 Unlocked! 15 Tasks Completed: Mission -5 Unlocked! 20 Tasks Completed: Mission -1 Unlocked! HYDRA can be found in Mission 1: Splintering Cells. A.I.M. agents can be found in Mission 2. Servo Guards can be found in Mission 5: Lockdown. Savin is the Boss in Mission 5: Lockdown. Over The Top is Union Jack's third ability. Union Jack is the team up in Mission 1: Splintering Cells. Red Hulk is the Team-Up in Mission 2: Heated Negotiations. 8b. Puts up a brick! 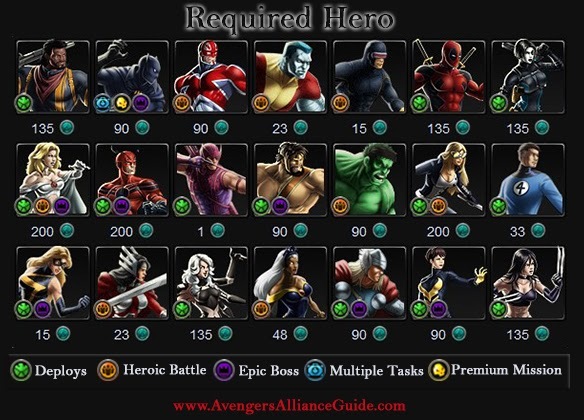 Bulwark is Red Hulk's third ability. Red Hulk is the Team-Up in Mission 2: Heated Negotiations. Valkyrie is the Team-Up in Mission 3: Tourist Trap. Geirr is Valkyrie's first ability. Valkyrie is the Team-Up in Mission 3: Tourist Trap. Wrecker is the Boss of Mission 3: Tourist Trap. Destroyer is the Epic Boss of Mission 3: Tourist Trap. Angel is the Team-Up in Mission 4: Circular Speculation. Aspersio is Angels third ability. He is the Team-Up in Mission 4: Circular Speculation. Blizzard is the boss in Mission 4: Circular Speculation. Thundra is the Team-Up in Mission 5: Lockdown. Cyclone Smash is Thundra's fourth ability. Thundra is the Team-Up in Mission 5: Lockdown. Black Panther is the Team-Up in Mission 6: On The Prowl. 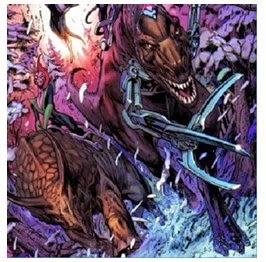 Wakandan Arts is Black Panther's second ability. Black Panther is the Team-Up in Mission 6: On The Prowl. Venom is the Epic Boss in Mission 6: On The Prowl.